The information on this page was kindly provided by Pedro Caldeira Cabral. "The Cittern in Portugal and the Portuguese Guitar"
The instrument we now call a Portuguese guitar was known until the nineteenth century throughout Europe as Citra or Cítara (Portugal and Spain), Cetra, Citra or Cetera (Italy and Corsica), Cistre (France), Cittern (British Isles), Zither,Zithern, Sitra and Zitharen (Germany, Sweden and Low Countries). Directly descended from the Renaissance European Cittern derived in turn from the medieval Citole, the Portuguese guitar as we know it underwent considerable technical modifications in the last century (dimensions, mechanical tuning system, etc.) although it has kept the same number of courses, the string tuning and the finger technique characteristic of this type of instrument. There is evidence of its use in Portugal since the thirteenth century (Cítole) amongst troubadour and minstrel circles and in the Renaissance period, although initially it was restricted to noblemen in court circles. Later its use became popular and references have been found to citterns being played in the theater, in taverns and barbershops in the seventeenth and eighteenth century in particular. The earliest evidence of the use of the cittern in Portugal come from a report by Garcia de Resende (Singer, Lutenist, Poet, Politician and author of the royal chronicles of kings John II and Manuel I, compiler of the celebrated Cancioneiro Geral), who referred a cittern being carried to the royal ship, together with with 3 viols to entertain the princess Beatriz during her journey to meet her future husband the Duke of Savoy in 1521. In 1543, the famous poet and humanist Jorge Ferreira de Vasconcelos included in his play Eufrosina a popular saying: "Words without actions are like Citterns without strings." In 1582, Friar Phillipe de Caverell visited Lisbon and discribed its customs; he mentions the Portuguese people’s love for the cittern and other musical instruments. In 1649 was published the catalogue of the Royal Music Library of King John IV of Portugal containing the best known books of cittern music from foreign composers of the sixteenth and seventeenth centuries, in which the complexity and technical difficulty of the pieces allow us to believe thet we had highly skilled players in Portugal. 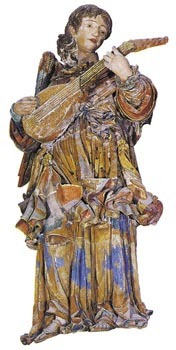 The angel playing the cittern (c.1680), a sculpture of big dimensions in the Alcobaça monastery, depicts in detail the direct ancestor of our Portuguese guitar. Portuguese sculpture c.1680, in the Monastery of Alcobaça, Portugal. In the first half of the eighteenth century (between 1712-15), Ribeiro Sanches (1699-1783) had cittern lessons in the town of Guarda as [he] himself mentions in a letter from St.Petersbirg, where he stayed as the private physician of the tzars in 1735. In the same period there [is] other evidence to the use of the cittern alluding to a repertoire of sonatas, minuets, etc. shared with other instruments such as the harpsicord or the guitar. Later in the century (ca. 1750), the so-called "English" guitar made its appearence in Portugal. It was a type of cittern locally modified by German, English, Scottish and Dutch makers and enthusiastically greeted by the new mercantile burgeoisie of the cities of Lisbon and Oporto who used it in the domestic context of Hausmusik practice. This consisted of the "languid Modinhas," the "lingering Minuets," and the "risqué Lunduns," as they were then called. The use of this type of Guitar never became socially widespread. It disappeared in the second half of the nineteenth century when the popular version of the cittern reemerged into fashion again by its association with the Lisbon song (Fado) accompaniment. We find the last detailed reference to the Cítara in 1858 in the book of J.F.Fètis, "The Music Made Easy." The Portuguese translation includes a glossary describing the various characteristics (tunings, social status, repertoire, etc.) of both cittern and "English" guitar of the time. Nowadays, the Portuguese guitar [has become] fashionable for solo music as well as acompainiment, and its wide repertoire is often presented in concert halls and in the context of classical and worldmusic festivals all around the world. Apart from these notes included in my double CD "Memórias da Guitarra Portuguesa" and dedicated to the repertoire of both 18th century "English" Guittar and modern P.Guitarra, I have collected many other references to the use and presence of the former cittern model in Portugal long before the "introduction" of the "English" model. In the 1649 Royal Library catalogue is listed a manuscript for Cittern (lost in the earthquake of Lisboa in 1755) which presumably contained works from Portuguese authors. In 1652, [in] the inventory of Francisco de Leão is mentioned a cittern bought in Lisboa for 480 reis and taken to Brazil for the Governor of S.Paulo. In the BN ms.B.16.23 in our National Library I found reference to Father João de Lima, whose knowledge of many instruments listed included in the second place the Cíthara all along with the organ, the theorbo the harp, etc. The Portuguese language dictionaries of Rafael Bluteau (1719), Morais e Silva (1789), Fonseca e Roquete (1848), Eduardo Faria (1849) all published in Lisboa, refer [to] the Cithara and the Guitarra as two different instruments, sometimes giving details of number of strings, size, etc. Some instruments survived and are kept in reserve in the Music Museum, Lisbon and in private collections. With time and patience I could add a greater amount of evidence, but I think this is enough to credit my opinion on the presence of citterns in Portugal long before the invention of the "English" instrument. Last updated Thursday, June 21, 2012. How to cite this page: Cabral, Pedro Caldeira. "The Cittern in Portugal and the Portuguese Guitar." Renovata Cythara: The Renaissance Cittern Site. Ed. Andrew Hartig. 21 June 2012. 19 April 2019. <http://www.cittern.theaterofmusic.com/misc/portugal.html>.